Definition at line 16 of file HierCodeData.h. Definition at line 16 of file HierCodeData.cc. Definition at line 22 of file HierCodeData.cc. Definition at line 27 of file HierCodeData.cc. 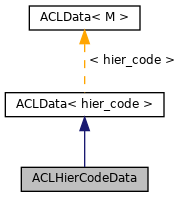 Definition at line 78 of file HierCodeData.cc. Definition at line 37 of file HierCodeData.cc. References hier_code_str, HIER_MAX, HIER_NONE, and values. Definition at line 69 of file HierCodeData.cc. References HIER_MAX, HIER_NONE, and values. Definition at line 31 of file HierCodeData.cc. Definition at line 50 of file HierCodeData.cc. References fatalf(), hier_code_str, HIER_MAX, HIER_NONE, NULL, ConfigParser::strtokFile(), and values. Definition at line 32 of file HierCodeData.h. 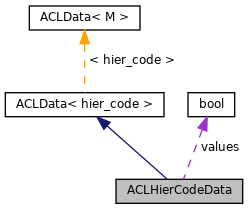 Referenced by ACLHierCodeData(), dump(), empty(), match(), and parse().